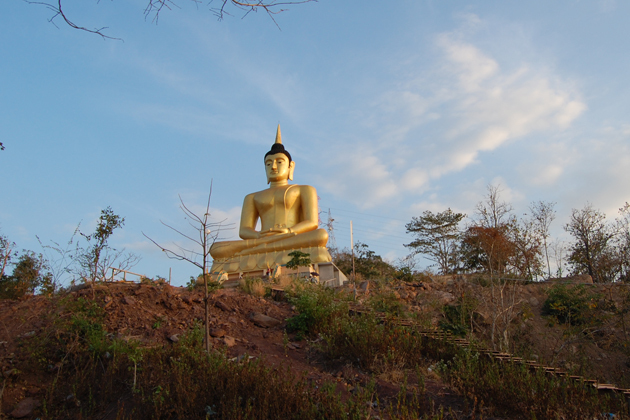 Always being on top 1 of things to do in Pakse, Golden Buddha is a must for visitor whenever they have arrived in this attractive land. The presence of Golden Buddha strongly implies the big influence of Buddhism in Laos and generates a peaceful impression about this city. 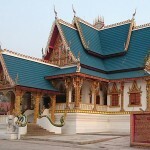 The statue is located in Pakse which is the provincial capital of Champassak Province in the southwest of Laos. During French colonization, the southern part of the city is under control of French control and had many economic developments. 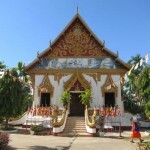 At that time, Pakse was divided into two parts by Mekong River and in order to enhance trading between Laos and Thailand, Nippon Bridge was built through Mekong River connecting two parts together. The other side of the bridge which is near Thailand is where Golden Buddha located nowadays. Nippon Bride or Japanese Bridge (which has been sponsored by Japan) is the key point if you want to visit Golden Buddha. In total, it is about two kilometers in length; therefore, you can take a taxi or tuk tuk to finish the bridge. And then you have two options: the first one is continuing using tuk tuk to get to the top or secondly, walking up to the top by your own as a good way to get the sweat out. It is definitely a challenge for those having unsuitability of fitness to going up! During the way up, you will have a chance to see many other statues alongside and one thing that can’t be missed is nature. There is a Buddha statue feature a Snake God behind Buddha and is trying to protect him. After reaching the top, there is Golden Buddha Statue sitting still on a lotus flower. 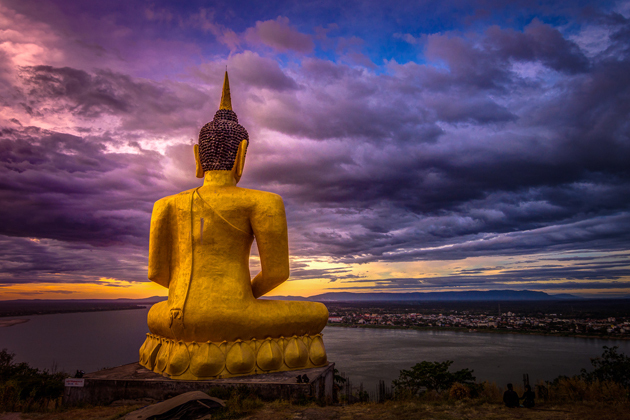 From Buddha’s hill top, visitors can have a view over peaceful Pakse city and Mekong River. Especially, the sunset over Mekong River is a masterpiece, a gift from the heaven. 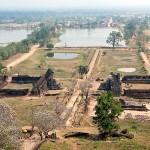 Seeing the whole city gradually turn into darkness could be an unforgettable moment during your Laos’ Tour. This spectacular view over the city is fabulous and also the main reason people taking such a long way up here. Moreover, as an additional reward, there are also several smaller golden Buddha Statues presenting around in the end of your journey. • If you are about to take the stair to the top, please make sure that you are strong enough. It is not suitable for people with problem with health. • Remember to wear comfortable shoes for hiking since you have to take long time to get to the top. • Be careful of steps, some of them have been damaged; therefore, it is quite slippery. • Bring along your camera to capture breathtaking moment in the sunset and the Golden Buddha.